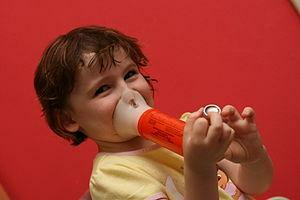 Usually, people who suffer from asthma suffer from some kind of allergies as well. Asthma, per se, is a condition affecting bronchial tubes which distribute air in and out of the lungs. Depending on the symptoms and manifestations of this condition, there are several types of asthma one can suffer from. If asthma itself is triggered by an allergic reaction to certain substances like pollen, for example, the condition is referred to as allergic asthma. This is quite a common scenario and about 50% of all asthma patients suffer from allergic asthma. Bear in mind that there are over 20 million individuals suffering from asthma in the US. When we breathe, the air we insert into our body travels to bronchial tubes from our nose, through the windpipe. Bronchial tubes contain tiny sacs of air at their ends and these sacks are called alveoli, delivering fresh air into our blood. However, there is yet another role of these sacs, being the collection of carbon dioxide and its distribution out of the body, through exhalation. When people suffer from asthma, this air circulation is inhibited in several different ways. First of all, the surrounding muscles around the airways get tense, narrowing the area, making the air flow more constricted. Secondly, the lining of the airways swells and succumbs to inflammation. Finally, mucus production in the area increases, leading to creation of substance which is much thicker than regular mucus, preventing proper breathing. According to researches carried out by the National Institute of Allergy and Infectious Diseases, 13 million absences from school take place every year, due to asthma. Also, asthma is the third most common reason behind the hospitalization of children under the age of 15. Allergies affect about 50 million people in the US and are the sixth most common cause of chronic diseases. Asthma symptoms can differ from one individual to another. Nevertheless, all symptoms can escalate if the person suffering from allergic asthma gets exposed to his/her allergens. Either way, asthma attacks manifest through frequent coughing, getting much worse during the night, shortness of breath and frequent loss of breath, fatigue during exercising, followed by wheezing, coughing and other breathing problems. Additionally, one might experience other allergic reactions, along with sleeping difficulties and respiratory infections. Among allergens which can trigger asthma attacks, the most common are dust mites, pollens, pets, food, insects like cockroaches or certain types of food. Basically, most allergens which trigger other allergic reactions can lead to asthma attacks and worsening of other asthma manifestations too. Speaking of other reasons behind asthma, we need to mention infections like colds, sinus infections and flu, exercising, climatic changes, tobacco smoke and air pollution, dust, strong smells emitted from chemicals and certain medications like Aspirin, ibuprofen and beta blockers. Additionally, stress and overwhelming emotions are known to lead to asthma attacks too. So, getting angry and frustrated, being anxious, crying, yelling or laughing violently are actions which can either cause an asthma attack alone or make allergic asthma attack even worse. The best ways of limiting or preventing an asthma attack is by avoiding situations and exposures which cause this condition in the first place. Monitoring your condition and keeping track of the symptoms of both allergic and other forms of asthma are helpful steps too. Finally, medications can prove to be of great assistance. These are anti-inflammatory medications, leukotriene modifiers and bronchodilators. Bronchodilators clear out the excess mucus from the lungs and relax the muscles around the airways, allowing more air to reach the lungs and prevent breathing problems. Since these medications stop asthma symptoms, they are excellent to be used during an asthma attack. As far as anti-inflammatory medications are concerned, these reduce the swelling and the excessive production of mucus, disallowing the symptoms of asthma to occur. Leukotriene modifiers, on the other hand, improve the airflow through our lungs and body by preventing the tightening of the airway muscles. Asthma medications are usually administered through specially designed inhalers, taken in the form of powder, liquid or vapor, released in a proper dose. There is no cure for asthma so far. This means that it is a chronic condition which you need to maintain properly in order to prevent any symptoms from appearing. Fortunately, you can monitor your asthma symptoms through a peak flow meter, which is a device measuring the speed of air coming out of the lungs once you release it with force. All in all, asthma is a condition which can have serious symptoms, but can be successfully maintained nevertheless. In cases of allergic asthma, it is best to stay away from the allergens which trigger the attacks and make them worse. Thus, seek medical assistance in order to find out which allergens make your asthma symptoms escalate. Leading a proper lifestyle, free of smoking and unhealthy habits can certainly contribute to your health and absence of asthma-related problems. comparing flixotide or becotide with salmeterol separately to flixotide?